1. Governments lose elections more than oppositions win them. It’s an old adage in politics, but these elections really underlined how voters had got fed up with the ruling centre-left Partido Socialista Obrero Español (PSOE). With all the results in, the centre-right opposition Partido Popular (PP) saw its vote increase over 2008 by around 500,000 whereas the PSOE vote collapsed by 4.3 million. In terms of vote share, however, that translated into the PP going up from 39.9% to 44.5% and the PSOE falling from 43.9% to 28.7%. The verdict of the voters was that they wanted rid of the PSOE, but the latter’s vote does not seem to have switched to the PP. Overall turnout was down only about 2%, so PSOE votes went elsewhere. 2. The left-wing Izquierda Unida (IU) group, built around the former Communist Party, had its best election result in years, with 11 seats compared to just 2 in 2008. Its overall vote increased by just over 700,000 – a bigger rise than that enjoyed by the victorious PP. Another left-wing group, the new Unión Progreso y Democracia (UPyD) won nearly 5% of the vote (1.1 million) and 5 seats. Disillusion with the PSOE therefore looks like it translated in part into votes for more radical alternatives. 3. 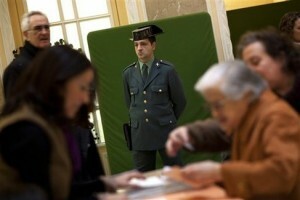 Turnout in the Basque Country was up around 5% compared to 2008, bucking the national trend of a slight decline. That may be the result of the recent definitive announcement by ETA that it has abandoned arms, allowing the elections to take place without their potential threat overshadowing the contest. The big winner in the Basque Country was the new left-wing nationalist coalition, Amaiur, which became the largest party – mainly at the expense of the Socialists. 4. The PP’s electoral campaign was based on saying very little about what they would do, relying instead on the clear unpopularity of the PSOE. New prime minister, Mariano Rajoy, made very few specific commitments, beyond the promise to take ‘serious and profound’ action to deal with the economic crisis in Spain. He has also promised to leave pensions untouched, which means there will inevitably be further sharp cuts in health and education spending. The PSOE government, meanwhile, was seen as so toxic that outgoing prime minister José Luis Rodríguez Zapatero was restricted to just one shared platform appearance during the campaign with his replacement as candidate, Alfredo Pérez Rubalcaba. 5. Charisma seems to count for little in Spanish politics. Like José María Aznar, his predecessor as prime minister from 1996-2004, Rajoy is seen as a rather dull, grey figure. A minister in the Aznar administrations, Rajoy is a great political survivor – the 56 year old was standing as PP candidate for the third time of asking, but this time his success was assured from the moment when support began to haemorrhage from the PSOE. The outgoing premier, Zapatero, was also short of charisma, being infamously compared to the hapless Mr Bean and seeing his image embarrassingly replaced by the latter when hackers broke into the official website at the start of Spain’s EU Presidency in 2010.